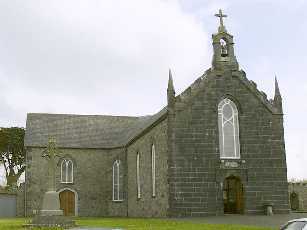 The present day church in Askeaton was built on a site on the western road during Fr Edward Cussen's time as parish priest. Building was commenced in 1851 and was completed in 1853. 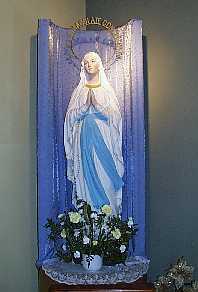 The church is dedicated to St Mary. The church was restored under the leadership of Canon Thomas Kirby and Bishop Newman rededicated the church on the 23rd of May 1977. In front of the church in Askeaton, there is a cross that marks the grave of Fr Edmund Treacy. Between the period of time that the parish church was burned in 1847 and the completion of the present church in 1853, mass was celebrated in what is now Fitzgibbon's Store in Brewery Lane. 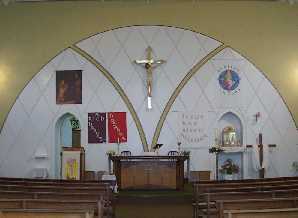 In the church, there are two stained glass windows at the centre of the nave. The window on the left is in memory to Mary and Brigid Casey, both of whom died from TB at age 19. The window depicts St Patrick receiving the two daughters of King Laoire, the King of Ireland into the church. 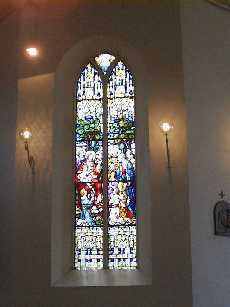 The window opposite it shows Jesus with the little children. 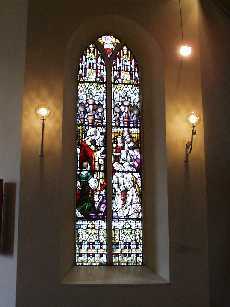 This window is to the memory of Annie Mulraire. The stained glass window in the right transept shows the Resurrection while under the gallery there is a statue to the Immaculate Conception. In the left transept the stained glass window depicts the Ascension. 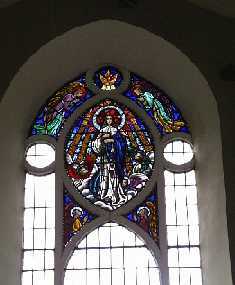 Over the main door of the church, the stained glass window to the Blessed Virgin Mary is in memory to the McDonnell family of Milltown. 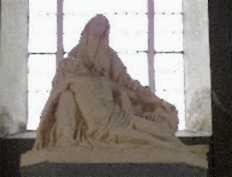 Also over the door, there is a large statue of the Pieta.